Our control panel for producing up to 20 gallons of finished product per batch, back to back. Pre-assembled and ready to use. A single element is used in the boil kettle and hot liquor tank, but both may be run at the same time allowing you to boil one batch while heating water for the next (or for cleaning/heat sanitizing the chiller). For more information see our FAQ: Adapting for a back to back setup. The control panel is the heart of our Electric Brewery and provides us with extremely repeatable and consistent results whenever we brew. Carefully hand crafted in the USA to our exacting specifications using non-proprietary industrial-grade components for reliability and long term use. Buy once, use it a lifetime. Due to the custom nature of this product please allow 2-4 weeks lead time. US only sales for this product (more information). Almost two years of work have gone into the design and development of this control panel to ensure that it works well ergonomically, is safe to use, and includes all the features a brewer could possibly need. Go electric for safe, easy, and enjoyable indoor brewing. Assembled control panels feature a special product tag with serial number and build date. Which control panel is right for me? Standard 30A Electric Brewery Control Panel: For producing up to 20 gallons of finished product per batch. A single element is used in both the boil kettle and hot liquor tank. 50A Electric Brewery Control Panel for back to back batches: For producing up to 20 gallons of finished product per batch. A single element is used in the boil kettle and hot liquor tank, but both may be run at the same time allowing you to boil one batch while heating water for the next (or for cleaning/heat sanitizing the chiller). For more information see our FAQ: Adapting for a back to back setup. 50A control panel for 30+ gallons: For producing more than 30 gallons of finished product per batch or to speed up your brew day by reducing heat times. Perfect for 1-3 bbl pilot systems. Up to two elements are used per kettle with one kettle powered at a time. If you're consistently producing 30 gallons or more, or think you may want to in the future, this is the panel for you. You may use two heating elements for now and add two more in the future. For more information see our FAQ: Adapting for a 30+ gallon setup. International control panel kits for 220-240V countries (United Kingdom, Australia, New Zealand, many parts of Europe, etc.) are also available. For more information see our FAQ: Adapting for 220-240V countries. Our panels may also be run off a single phase of a 208V or 400V 3-phase power grid. Contact us for details. The control panel includes all the features a brewer could need. The intent is to not limit the brewer in any way. Three PID controllers for precise control and monitoring of kettle temperatures in either Celsius or Fahrenheit (0.5 degree Fahrenheit precision, 0.1 degree Celsius precision). Advanced programmable countdown timer with external reset button and non-volatile memory (countdown is remembered during power outages). Control of heating elements in the Hot Liquor Tank and Boil Kettle with selection switch(es). Supports both manual and automatic temperature control in the boil kettle to allow for advanced brewing processes such as hop stands where hops are steeped at specific temperatures for extended duration (not available on dial-type boil controls). This process is used by new popular New England IPA style beers including our own Electric Hop Candy. Control of two pumps (one for water, one for wort). Volt and amp meters for diagnostics and monitoring power usage. Industrial control guards on front door with carrying handles on top and bottom. LED pilot lights that last 30,000 hours, no bulbs to replace. Permanent industrial panel tags that will never rub or scratch off like silkscreening. Unlike etching ours will never fade and are safe around commonly used brewery cleaners. Oversized custom anodized heat sink (parts last longer if they do not run as hot). Integrated safe start interlock feature avoid accidental turn-on. Industrial grade nylon locking receptacles for cord removal/replacement. No hardwired cords or flimsy molded rubber plugs that are easily damaged and not replaceable. Wall mounting hardware and door locking key included. Industrial grade components built to last, many USA made. Open source design using standard off the shelf industrial parts (no special/proprietary parts) and published wiring diagrams to ensure easy long term serviceability. Designed to be used a lifetime as parts will always be available. 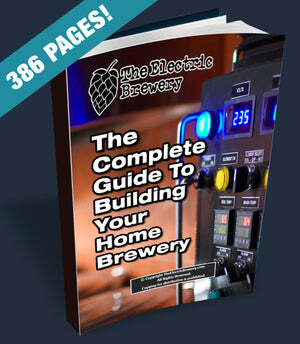 For more information on the usage of the control panel, see our Brew Day: Step by Step article. Keyed power switch (2 keys included). Element power is physically disconnected with mechanical relays when elements are set to off (avoids SSR leakage current). The safe start interlock feature does not allow the control panel to be powered on if an element or pump switch is in the on position. Uses parts that adhere to IP54 or IP65 protection rating to protect from dust and water. All external cable connectors are locking to avoid accidental disconnects during use. Industrial grade nylon receptacles. No hardwired cords or flimsy molded rubber plugs that are easily damaged and not replaceable. Unlike some commercially available brewing setups, our control panel uses standard off the shelf industrial parts to ensure long term serviceability. There are no special or proprietary parts. There is no custom or patent pending programming. This website also provides you with a comprehensive service manual including a complete parts list and wiring instructions. For more information on why we feel this is important, see our FAQ. Do the pre-assembled control panels require any work? No. They are pre-assembled, configured, and then tested under full load, making them ready to use. No soldering or assembly required, no special tools required. You simply attach the power cord, plug it in, and turn it on. Pre-assembled panels are professionally punched and powder coated with a matte charcoal finish (less shiny than the Rust-Oleum hammered metal finish spray paint we show in our DIY instructions). The Power Cord, Temperature Probes, and Heating Elements are not included and may be purchased separately. Do the pre-assembled control panels include the safe start interlock feature? Yes. The safe start interlock feature is included in all control panels. Power consumption: 240V / 38.6 amps max (9260 watts) when powering two 4500W elements and two pumps, or 240V / 46.9 amps max (11260 watts) when powering two 5500W elements and two pumps. Power input: One locking grounded California-Style male receptacle (125/250VAC, 50A) intended for use with our 50A power cord and requires a 240V 50 amp single phase service with ground and neutral to operate, such as a stove outlet found in North American homes. Heating element outputs: Two NEMA L6-30 (250VAC, 30A) twist lock female receptacles, maximum element power is 5500W x 2. Our pre-assembled Electric Brewery Control Panels are first wrapped in plastic and then shipped in custom double-walled boxes with polyethylene closed-cell foam inserts to ensure safe arrival. What kind of wall outlet do I need to tell my electrician to install? The 50A Electric Brewery Control Panel for back to back batches is usually plugged into a wall outlet using our 50A control panel power cord which requires a standard North American stove receptacle (4-prong 50A/240V). Ask your electrician to install a NEMA 14-50R receptacle. In the electrical breaker panel, the circuit breaker must be a 50A / 240V 2-pole breaker. We recommend that the breaker include GFI protection. "I recently ordered the diy version of the brew controller and temperature probes. I started working on the controller first and must say, this kit is extremely well thought out. Buying from you was the way to go and sure took most of the stress away." - Brad W.
"If you want an advanced system, solid consistency, ease of use, long term investment, easy serviceability and a total wow factor, you can't beat The Electric Brewery." (read complete review) - Scott B. Visit our official Electric Brewery Control Panel product thread in our forum.